WASHINGTON (Sputnik) - US Secretary of Defense James Mattis has set next Sunday as the date for his promised trip to Macedonia to support the Macedonian government’s move to join NATO, the Department of Defense announced in a press advisory on Wednesday. "Secretary of Defense James N. Mattis embarks Sunday, September 16 on a trip to Skopje, Macedonia to show US support for Macedonia during NATO accession and continued US commitment to peace and security in the region," the advisory said. Mattis had previously said that he would visit Macedonia ahead of an upcoming referendum on the change of the country’s name on September 30, while expressing concern about possible Russian interference in the process. "The secretary is scheduled to meet with and deliver a joint press statement with Prime Minister Zoran Zaev," the advisory added. A number of Western leaders — including Angela Merkel, Sebastian Kurz and Theresa May — have recently visited Macedonia in an effort to persuade Macedonians to participate in the referendum. 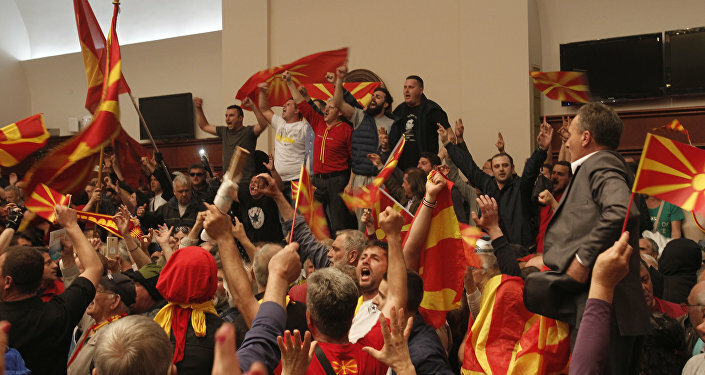 Macedonians have engaged a campaign of mass boycott, calling the referendum an attempt at genocide that seeks to legitimize the treasonous actions of the US-installed government of Zoran Zaev to undo the Macedonian nation-state and shift the responsibility onto them. In all polls, Macedonians have overwhelmingly rejected the government’s agreement with Greece to rename their country and therefore erase their Macedonian ethnic and national identity, but particularly for the purposes of membership in NATO and the European Union under US diktat. The polls reveal that between 80 percent and 90 percent of Macedonians will boycott the referendum. Greece has blocked Macedonia from entering NATO and the European Union despite a 1995 bilateral Interim Accord to allow Macedonia’s membership not under its name, but under the provisional reference "former Yugoslav Republic of Macedonia." Moreover, NATO has said the alliance was not bound by a 2011 International Court of Justice ruling that Greece has violated the Interim Accord.